Well it’s official. Oscar is five years old. We celebrated with a super fun party at a martial arts place nearby and even signed him up for a month of trial lessons. We have applied to several schools and await many decisions to help us decide where he will attend Kindergarten in the fall. He is two and a quarter inches taller than last year according to today’s well visit. His glasses suit him and his hearing is great. We are very blessed with a healthy boy. And Oscar is all boy. He is faster than fast and eager to learn. He loves to ask questions and more questions…and even more questions. Like me, he consumes his interests. He wants to know what they are, why they are and how they work. His teachers love him and we are so proud of our boy. Like most other five years olds, he often doesn’t know his own strength. It’s both challenging and wonderful to watch. Wouldn’t it be great to really believe you can defeat all the bad guys and aren’t afraid of anything? To think five years has passed since I first held Oscar in my arms is just plain crazy. I remember being pregnant so clearly, yet it feels like it never happened, like Oscar has always been here and he has always been five. I think that may be the oddest part of becoming a mom. You start out with all of these questions and hopes and fears and then at some point you just are. You are mom and you always have been. That is definitely how I am starting to feel. I cherish the memories from all my former “lives”, but mom is who I am; who I always have been, somehow. Last year I was in a panic about Kindergarten and growing up and moving forward. Today, not so much. We still don’t have answers and we still want the best for our boys. But I have a peace now that wasn’t there before. I am confident that while Jerry and I aren’t perfect, we are the best parents Oscar and Calvin could have. Our little family is complete and now we get to do life together. Five, three, fifteen years at a time. We are here for each other. 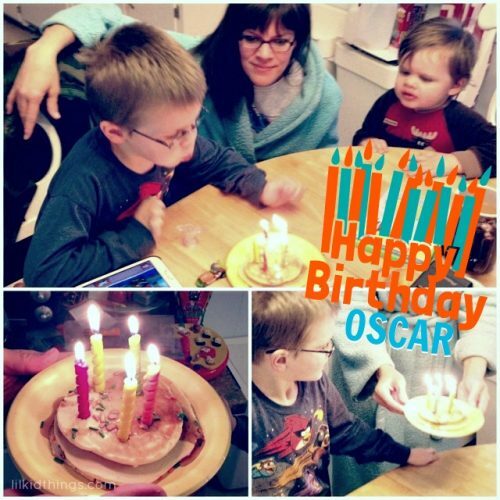 Oscar is five and we love celebrating him. My love overflows for this boy and I can’t wait to watch him grow into a young man. Check out Oscar’s fun Martial Arts Party!